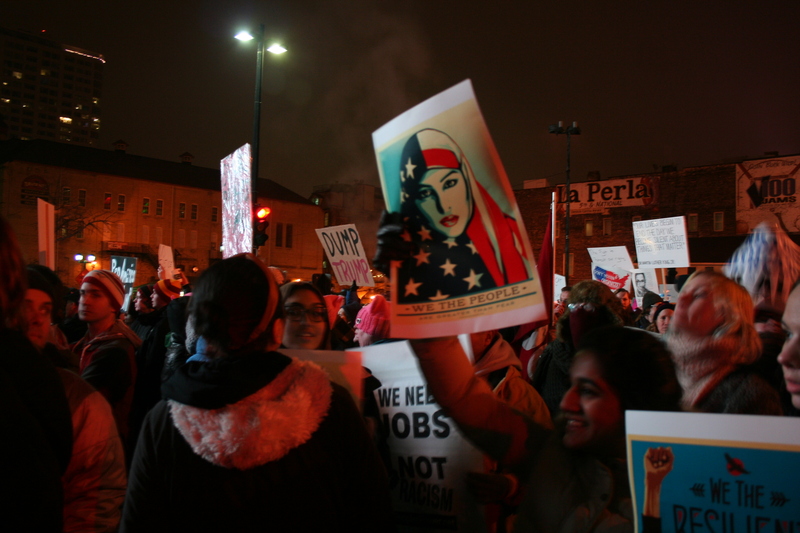 As the sun fell on Inauguration Day, nearly 1,000 demonstrators gathered in Red Arrow Park in downtown Milwaukee to protest the policies of Donald J. Trump, who became president earlier that day. Trump, who launched his presidential run with a sprawling speech at Trump Tower in New York City, in which he called Mexicans “rapists,” ran an unprecedented campaign, in terms of both tactics and tone. With a candidacy that tapped into the frustrations of working-class whites and an opponent who was the second most disliked presidential hopeful ever (Trump was the most unfavorable), he was elected on a wave of populism, aided by far-right, racist movements. The son of German- and Scottish-American immigrants, Trump got his start with a $1 million loan from his father, real estate mogul Fred Trump, who was investigated in 1973 for civil rights violations alleging rental discrimination in his residential properties. Trump has promised to build a wall between the U.S. and Mexico, re-negotiate trade deals to bring American factory jobs back, escalate the war on ISIS and deport millions of undocumented immigrants. He has expressed support for banning Muslims from the country, has said he would nominate supreme court judges that would overturn Roe v. Wade and has made his distaste for the media clear, threatening to “open up” libel laws to make it easier to sue journalists and news organizations. The billionaire has made headlines for boasting about sexually assaulting women on video tape, the unscrupulous dealings of his foundation and the many financial, and other, conflicts of interest he brings to the office. Wagner, who is black, said she believes people were persuaded to vote for him because of the message he put forth, one of upending the status quo. She said people are desperate for a change and hoped against hope that Trump might bring that change. “That’s what I think people are trying to attach themselves to, but that’s not what’s gonna happen,” Wagner said. Though Trump won 306 out of a possible 538 electoral college votes to take the presidency, he lost the popular vote by almost 3 million. With an approval rating below 50 percent, Trump enters office as the most unpopular presidential victor in history. People who were at the rally said they attended to support the rights of African-Americans, Muslims, women, immigrants and individuals who identify as LGBTQIA, groups that have felt threatened by the president’s rhetoric. Many of those in attendance represented these segments, as well. Zach Liszewski, who said he has friends who identify with many of these groups, believes in “equal rights for everyone” and came to the rally to voice his support for that ideal. Antonio Rodriguez, 32, who is gay and of Mexican descent, said he has reached out to Voces de la Frontera, a local membership-based community organization, and plans to fight for immigrant and migrant rights. He also said he intends to educate himself more on any proposed legislation — not just on the national but local level as well — to scrutinize elected officials and make sure they are truly representing the people’s interests. Others suggested donating to groups working for equality and getting more involved in local politics and issues. Individuals who were interviewed said they hope to see people come together and be more accepting of each other, and that the government is responsive to its people. Wagner said that, after Trump, she hopes for “a president that actually is concerned about all these things that we are constantly fighting for,” including health care, equality under the law and a level playing field for everyone. The crowd marched down West State Street to chants of “No borders, no nations; stop deportations,” “The people, united, will never be defeated” and more.